I am so delighted to see that one of the books I reviewed this year was chosen by ALSC for their 2011 Notables list. Not that I am in any way responsible for this book, but it was one of my favorites that came across my desk in the past year. 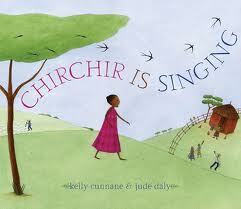 Chirchir is Singing by Kelly Cunnane & Jude Daly. Oh man did I love this book. I was really hoping it would get a starred review, but SLJ reviewers can only suggest--the editorial staff makes the final decision on stars. I was happy to see that it got a starred review from Publisher's Weekly though. It's just the kind of multicultural story that we need more of, because it's not *about* multiculturalism. The story is universal. We don't need more picture books about Civil Rights. We need more picture books that portray the world as it is now--vibrant, diverse, and beautiful. Learning about history and other cultures and ways of life is very important, and we're doing well at publishing those kinds of books. We need more books that reflect diversity without being about diversity. No more, "This is how poor children in Africa live." More bedtime books, more friendship stories, more holiday books, more everything--that just happen to feature kids who aren't white. Just like the world we live in. This soapbox of mine is part of why I became a School Library Journal reviewer--the chance to review multicultural books from this perspective. So, Chirchir is Singing is wonderful. The text is lyrical, the story is charming, and Chirchir herself is simply darling. And the art. Oh, the art is wonderful. Daly uses a rather naive folkart style--that is to say things don't look realistic. Figures are stick-like, perspectives is stacked, and everything is simplified. It's easy to look at this kind of art and think that it's not very good or that the artist isn't very skilled; however, that is not the case. By choosing this style of illustration, the artist conveys a different tone than she would by using hyper-realism. The word that comes to my mind over and over with this book is joy. There's so much love portrayed through the illustrations--love of the land, love of family, love of animals. The colors are warm, the shading is soft and beautiful, and because things are simplified, the details included become that much more noteworthy. This is a book I'm so happy to see recognized, and one that is definitely worth a closer look. There are more photos of the illustration in this photo spread on Flickr. I loved this book! I didn't even realize you were the one to review it. It's consistently GONE from my new picture book display area which speaks so well to its great appeal.